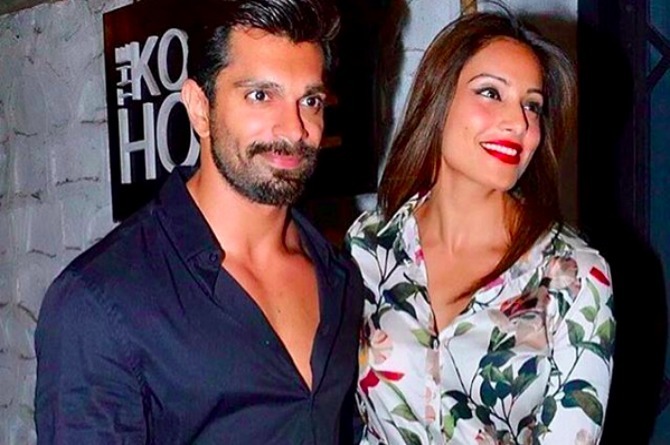 Newly Weds Bipasha And Karan Are Each Other's Perfect Date For THIS Reason! Newly weds Bipasha and Karan are each other's perfect date for THIS funny reason! Newly weds Bipasha and Karan Singh Grover are the latest 'it' couple of Bollywood. And rightfully so! The good-looking duo have been spotted together, enjoying each other's company at get togethers and parties. And their latest adventure together has been their trip to Madrid. Bipasha and Karan who are currently in Spain, Madrid, for IIFA 2016 are living it up in style. They attended the award functions in their best looks yet and have not failed to impress the fashion police. In their latest outing to the green carpet (red carpet for IIFA) the couple again stole the limelight. While Basu looked ethereal in a navy blue outfit by Abu Jani Sandeep Khosla, Grover donned a back suit and bow-tie styled by Shyamli Arora. And it was perhaps this suit of his that made him Basu's best date ever! When the couple was quizzed about why it's great to be each other's date, Bipasha Basu quipped, "It's fab. We can talk through the award function, we can chit-chat. We can discuss what we like and what we don't like. And, he can carry my tissues in his pockets. Because I don't have any pockets!" And Grover added, "Husband ek hi hai, pockets bahut!" Well, not only is this couple good-looking, they are also pretty funny. A video of their hilarious response was posted by Vogue, take a look. The hot duo were was also slaying the carpet the night before in coordinated Indian outfits. They both looked great with each other and were seen receiving compliments from the media and fellow colleagues at the do. Continue reading to take a look at the couple's outfits that garnered them several compliments! While Bipasha Basu wore a Sabyashachi saree, Karan Singh Grover was again styled by Shymali Arora for the first night at the green carpet. The two also shared pictures of the same on their respective Instagram pages. The newly weds were also seen enjoying the capital city with friends including Shilpa and Raj Kundra. And if these pictures weren't enough to tell us how much this young couple was having fun, they also posted pictures of how they dressed for their shopping spree. This couple is definitely giving us major couple goals! If you have any insights, questions or comments regarding the article, please share them in our Comment box below. Like us on Facebook and follow us on Google+ and Twitter to stay up-to-date on the latest from theIndusparent! Even mumps can cause infertility among men? This social media challenge is sending kids to hospital. Is yours safe!